About the company: Noah Art Gallery has been specializing in oil paintings for 12 years, which ensures that each painting shipped by us is high quality and every purchase with us will be a positive experience to our clients. We supply Hand Painted Modern Wall Art Oil Paintings, Museum Qaulity Old Master(such as Van Gogh, Monet) Reproductions and Giclee Canvas Prints, including Abstract Art, Flower Art, Landscape Art, Seascape Art, Figures Art, Animal Art etc... We are a direct studio. All paintings are created by our own artists. We are enjoying a good reputation among our customers for Wide Selection of Creative Art, Excellent Quality of Higher Standard and Heartfelt Customer Service. No matter you are art gallery owner or art wholesaler, or individual of art lover, we are your best choice. 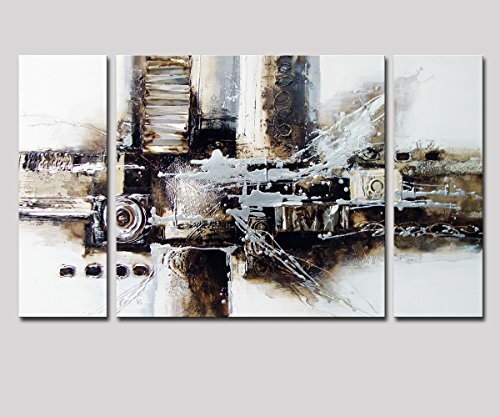 About the painting: This Black and White Abstract Art is a genuinely handmade art created by our professional and experienced artists carefully with artist grade oil and acrylic paints on canvas. You can see textured brushstrokes. The painting is gallery wrapped and stretched on a solid wooden inner frame. The painting is ready to hang, no additional frame required. This ABSTRACT PAINTING is perfect wall art for living room, bedroom, bathroom, kitchen, dining room and kids`room, home and office wall decoration. All paintings are inspected all-around by our QC team before shipping. Pls kindly check carefully both color and size to make sure if this ABSTRACT OIL PAINTINGS is fit for your room. Thanks very much for your time. Any question, pls feel free to contact us. What if the wall of your room is plain and you face a white wall in each morning when get up from the bed? What if this ABSTRACT WALL ART would bring you something inspirational and help you experience a new lifestyle? Click the "Add To Cart" to start enhancing the wall decoration of your home or office. If you have any questions about this product by Noah Art, contact us by completing and submitting the form below. If you are looking for a specif part number, please include it with your message.